• Bridal shower decorating with balloons can turn a ho-hum space into a spectacular place. Plain balloons can add color, dimension and excitement to your bridal shower. Those with designs can help reinforce your them. So, consider the space you're decorating. Get creative. A great idea is on its way! Bridal shower decorating with balloons made easy. You'll find out that plain balloons aren't so plain! • Latex or rubber balloons usually come in sizes from 5" to 36". 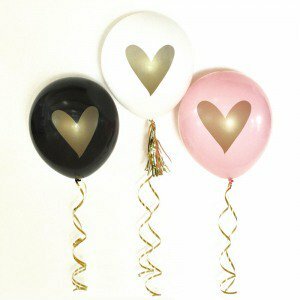 Considered plain balloons, they actually come in various shades of pastel, jewel tones, and neon colors. Their finishes are opaque, translucent or pearlized. They can be found plain or preprinted. They can be filled with air or helium. Helium will make the party balloons float from 8-10 hours, so make sure this is done the day of the Bridal Shower. • Foil or mylar balloons are made of plastic and nylon. 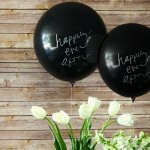 They make bridal shower decorating with balloons very simple. They come in a variety of sizes (including mini ones on sticks), and preprinted designs. Filled with helium, they can float up to two weeks. A good assortment of mylar balloons can be found at party stores, online, or even your local grocery store. • Curling ribbon: sold on spools in a variety of colors. It is used to help anchor balloons, and as a colorful accent. This ribbon actually curls with the blade of a scissor. It is found at craft, party, and online stores. • Balloon weights: these anchor the balloons, and are sold in plastic shapes and decorative foils. Any object with some weight, that you can tie party balloons to, can be used. You want it to be attractive as is, or cover it to coordinate with your Bridal Shower colors. Bridal Shower Decorating With Balloons Is Fun! If you have a large area to cover such as a hall, bridal shower decorating with balloons can create a colorful effect, with a minimal budget. Smaller areas will shine. Keep your bridal shower colors in mind. Using 3-6 balloons, tie a curling ribbon to each balloon. Connect all balloons at the neck. Use blades of scissors to curl the ribbon. Display around the room, wherever splashes of color are desired. • Balloon arches: bridal shower decorating with balloons can be done using arches. They make a dramatic statement at an entryway, over a buffet table, "guest of honor" seat, or any space you would like to highlight. Measure ribbon or fishing line 1 1/2 times the area you want covered. 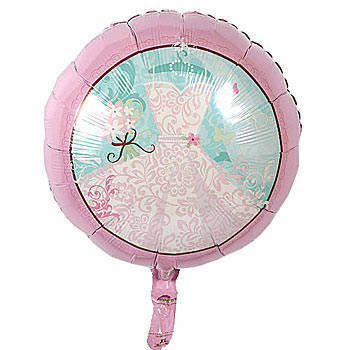 Using helium balloons of uniform size, in the desired color or colors, tie with ribbon to the main line. When all balloons are in place, tie or tape the arch to the table or floor to secure. • Balloon centerpiece: inflate desired number of plain balloons with helium. Tie ribbon around the neck of each. Vary the lengths of the ribbon for a staggered effect. This will add interest. Gather ribbon together at the bottom and attach to a decorative balloon weight on the table. 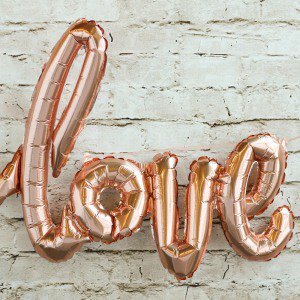 A variation of this Bridal Shower balloon decorating idea is to use a preprinted mylar balloon with a bridal shower design on it, as your central balloon, and surround it with latex balloons in theme colors. • Using the above idea, you can add the party balloons to any table centerpiece you already have. For example, hide the balloon weight inside of a floral arrangement for an extra special efect. • Mini mylar balloons: These have preprinted designs and are already on sticks. A simple bridal shower balloon decorating idea is to add one or more of these to a seasonal plant. Tie a silk ribbon around the planter and you have an elegant arrangement. What's a party without balloons? Bridal shower decorating with balloons makes it almost impossible to go wrong. Use your imagination. Have fun! Be colorful! Don't stress! • Go from balloon decorating page to Bridal Shower Ideas. • Bridal shower decorating with balloons can be easy and cost effective.